Today’s cookie is from the latest episode of Top Chef Just Desserts. The challenge: Dessert Wars! Where contestants broke into two teams and created dream pastry shops. One team called theirs “Pastry Playland” while the other team made a shop focusing on comfort food and called it “Whisk Me Away”. I won’t tell you who won, but Morgan, Eric and Danielle’s “Whisk Me Away” served these cookies. The recipe is from Eric, whose Bravo bio says he works at Baked in Brooklyn. So how are the cookies? 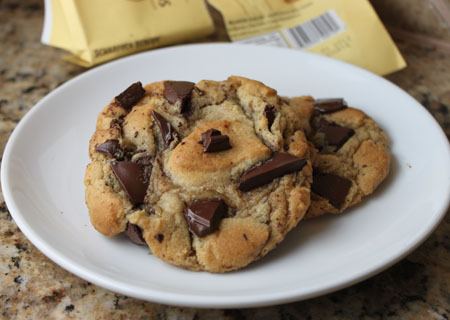 These are CCC’s at their best, but only if you like yours big, chewy, and with chunks of chocolate instead of chips. In fact, I wouldn’t recommend making these with regular chips. For one thing, big cookies need big chunks, but also the dough is slightly lower in butter and perfect for accommodating richer, high quality chocolate…..and a lot of of it! Even Elizabeth Falkner thinks so. Bravo took a How-To video of her making the cookies. Salt issue aside, the cookies are REALLY good. Just use good chocolate. I also threw in a teaspoon of vanilla because I couldn’t stand leaving it out. Here’s the un-adapted version (update: Bravo moved the recipe so it’s no longer there). 1. Melt butter, cool slightly. 2. Paddle sugars with melted butter. 3. Whisk together dry ingredients. 6. Bake at 325 for 14 min or until golden brown. Where do you buy your ingredients and what brand of baking soda are you using? The amount of baking soda called for is pretty standard, but if you are one of those people who is sensitive to the flavor (and some people really are), then your best bet is to look for another recipe. If you email me using the contact information at the top of my blog, I’ll send you a chocolate chip cookie recipe you might like better. Hi anna, I just made a batch a few days back. Some parts of the cookie had the unpleasant baking soda taste. Also I can’t get my cookies to look like the ones you posted, with nice looking cracks and bumps. Can I have some advise pls? Thanks! Emily, I hope you like them. Erika’s were good too. I think I’m going to make these, Anna! Thanks for adapting the recipe. Grams and ounces confuse me. I just got asked for some big chewy CCCs… Thanks for having such a useful index on your site! Sure! I halve recipes all the time. It’s very easy if you have a little scale. I just found your blog and these cookies look DELICIOUS! Do you think I could successfully half the recipe? I made this this morning (dough was made on Wed night, baked Fri morning) and they were fabulous. I think they are easier and have a better texture than the CI cookies, and share qualities with the Engineer cookies but w/o the fuss. The NY Times chocolate chip are still my absolute favorite, but they’re so fussy that I only make them on special occasions. These are great cookies and would hold up really well to a lot of mixins. I used Guittard super chips. These look great! I am going to try these over the weekend. When are you going to open up your own bakery? I would fly from D.C. to Austin to eat your goodies! Deb, there are a million jokes in that step but I’m not going down that road ;). Anyway, I think he just used “paddle” as a verb since you mix the butter and sugar with the paddle attachment on a stand mixer. I don’t see why you couldn’t just use beaters or a spoon for this step, though. Making these as we speak — what is “Paddle”-ing????? Just combining — maybe doing a little butter/a little sugar…a little butter/a little sugar???? Can’t wait to pull them from the oven! Melissa, I just divided all the gram measurements by 28, converted to oz and put the volume. Grams are more precise, but for those without scales I think the volume measures will help. Nancy, I just posted the answer to your question in the comment section of your brownie post. And the brownies look delicious. I haven’t had to bake gluten free for a while since no one in my life has a gluten intolerance, but it’s good to have a stash of reliable gluten free recipes on hand for bake sales and the like. I’m sure people with dietary issues appreciate it. Louise, here’s what I’d do if I were you. Make the dough and put some of the wafers in a portion of the dough. Chill, bake, and see what happens. My hunch is that the Guittard wafers will spread as much as the extra smooth Lindt. A little spreading is okay, but I wish I’d taken a picture of how much the Lindt spread. That was NOT okay. I still have some chocolate-free dough in the refrigerator and am toying with the idea of stuffing portions of it with Fuzz’s Halloween haul — Reese’s, Hershey’s, and some dark chocolate too. Anna, I have E. Guittard Bittersweet Chocolate Wafers. Are these cookies worth using them? Anna, I think you are right about the TV demo issue–when you are demoing you have to move right along & finish in a certain timeframe. I’ve found that interviewers sometimes ask questions or make comments that get me off the track, so I end up skipping the exact amounts. A lot of stations now post the recipes on their websites, because they know the demos tend to skip a lot of things. BTW, I just posted a good gluten-free brownie, plus why I just cringe when people make substitutions in my baking recipes. Does this bother you, too? Wow, these cookies look great. I haven’t been to Baked yet or seen the show. Thanks for posting this and correcting/elucidating the measurements! Meryl, I think Elizabeth was using the correct measurements but maybe she was *saying* the wrong ones. In my experience, food stylists or production assistants measure things out. So I’m thinking everything was measured out properly, but maybe they gave Elizabeth a script with the wrong measures or she was just improvising and saying “about” this or “about” that knowing people had the correct measurements in the recipe. This is one reason I use magazines and books for recipes and don’t rely on TV demos. I think they help if you’re trying to master a technique, but even techniques are often done quickly or “stagey” in food demos. They have to move fast so people won’t lost interest. I think Bravo needs to check your blog for consistency updates. I watched EF video too & took notes as she rattles off what she mixed. Too funny that they don’t check the facts. I got the impression that maybe she was guessing at what was in the bowls she dumped. Thanks Anna! Oh wow, they look perfect. I love chewy choc chip cookies. Time to get baking! I *know* your measurements are right on, as always, and I thank you for converting the grams into ounces – it saves me from using the measurement converter! Meanwhile, I don’t understand how Elizabeth Faulkner could have been so off on her measurements, and still come out with good results. And you’re right – not only did she add 2/3 cup more flour, but she also used an extra 1/2 cup brown sugar. How can she even claim that she was making Eric’s recipe??! Meryl, you are right! I think she also used 1 1/2 cups of brown sugar rather than 1 cup packed. The measurements above are correct, though. I checked them a couple of times and used the ones above for making the cookies. I just saw the video. Faulkner halved the recipe, but failed do so with the flour, ie, she added 3 cups. Half the original amount would be about 2 1/3 cups as you have listed in your notes. Hooray! Glad to hear someone else made these awesome cookies. Flat cookies can happen for a few reasons. Sifting isn’t really an issue here (it’s more an issue in cakes or when you’re measuring by volume and recipe writer didn’t specify whether the flour had been sifted before or after measuring), but using a really high butter fat cocoa might cause spreading, baking on a thin cookie sheet, not using enough flour, (maybe?) using melted butter that’s too warm could all contribute to flatness. It sounds like you did everything by the book, so maybe it was the cookie sheet. If you have some dough leftover, try chilling it. My first round of cookies made with un-chilled dough were significantly flatter than the dough I chilled overnight. Another trick you can do is bake the cookies on two stacked cookie sheets. My wife and I just made this recipe and they are easily the best CCC that I have ever had. Our batch came out a bit flat, and I was hoping to get the thicker cookie. Any suggestions on our error? We followed the recipe to a tee, though we did not sift the flour…should we have? Thanks for the tips about chocolate, I probably would have used Lindt Excellence, and I do like the look of your cookies better than Elizabeth’s. I have Ghir. 60% chips, I might try a small batch with those and see. I love those chips, they are my favorite. I would have to go clear to SLC to get SB chocolate, or any of the really expensive, good ones. Which quite annoys me, sigh. So you said you used 1 t. salt for half batch and they were good? Did you use regular kosher salt? Louise, I froze some of them and put a few others in a plastic zipper bag in the pantry. The ones I froze were excellent on Day 2. They were somewhat softer after being frozen and thawed, but still very good. The ones in the pantry were pretty good on Day 2 as well. They were dryer, but the flavor was still good and they didn’t develop a stale taste. Maybe the high ratio of sugar helps keep them fresher longer? I don’t know, but they were good. How did the cookies hold up? Or were they gone before you could find out? They looked great on the show (I thought they were a good idea for the Dessert Shop Wars contest, if a bit risky) and great on your blog! Another CCC recipe to try! Your cookie looks so much nicer than the ones on the screen capture from the bravo video!! Did you prefer the taste & texture of the cookies you chilled overnight or the ones you baked right away? Yum! Thanks for sharing and your tips for a home chef! Thank you for drawing my attention to this show. It has become a family favorite. I thought of you when they did the bake sale episode. You could have rocked that competition. I am curious, if given the task, what would you dream up for that episode? Stephanie, I don’t think it was a typo. A lot of New York based chefs use Diamond Kosher. The crystals are big so you have to use more of it. I’m not sure why chefs and bakers don’t note this when they write down recipes, but they don’t. It drives me crazy. People are going to make the cookies with 1 tablespoon of regular Morton Kosher and ruin them. Katrina, the type of chocolate you use makes a big difference. I used Callebaut chips in some of the dough. The chips tasted good but looked wimpy and tiny in relation to the big cookies. I used Lindt Extra Smooth 70% in some. That was a joke! The Lindt melted all over the tops of the cookies. The best results were with the Scharffen Berger semi-sweet (although bittersweet would be fine). Camille, they looked like dream cookies on the episode of Top Chef and I’m glad Bravo published the recipe. Baking Blonde, let me know if you make them! Dawn, you can use whatever you want. I used semi-sweet, but bittersweet would be great too. Sue, that’s interesting that the measurements in the video are different than Eric’s. But yes, she’s probably making a half batch. I ended up using a little less than 1 teaspoon for the half batch and that was the perfect amount of saltiness. Also, she must have used a smoother chocolate than Eric because her chips melted more. One last thing. When I made the cookies with un-chilled dough, my cookies looked more like Elizabeth’s. The cookies in the photo are made with dough that I’d chilled overnight. I watched it again, and in the video she must be making a half batch. She uses 1 1/2 sticks of butter and “about a teaspoon” of salt. Wow! These look amazing. I watched the video and I think in the video Elizabeth said 1 teaspoon. I should watch it again. i have those bookmarked. and you beat me to it. was it dark, semi or milk chocolate though? Wow, those sound amazing! I just made some brownies with huge rich chocolate chunks and have some left. these cookies would be perfect! These are like, my dream cookies. Incredible! I looked at that recipe & I was surprised by the amount of salt as well. I haven’t had a chance to bake them up yet, but they sure great. I was thinking of lowering the salt to 1 Teaspoon of Kosher. I was thinking maybe because he used such a bittersweet chocolate, that he wanted the saltiness. Since reading your take, I’m thinking it might have been a type-o. I’m hoping to do a side by side comparison between both the bravo recipes to see which one the family likes better. Thanks for testing it out! Lisa, these are very thick, dense and chewy. The cookies look beautiful, crispy and “cratery” on the outside, loaded with chunks. I love your stand mixer cookies, along with the NY Times CC Cookie recipe and always wonder if I should mess with perfection. These do have my interest though!